Just one of the branches on the tree that makes up the P&A Group of Companies is The Woodworks Garden Centre and Café. Situated in the heart of the North Wales borderlands in the town of Mold, The Woodworks has everything you’ll need for the garden. As P&A began to grow, various divisions were formed and in 2005 the Woodworks Garden Centre was born, symbolising the growth of the company and our appreciation towards nature and the environment. The Woodworks offers a vibrant plant area, a stunning range of timber garden products and a wide range of sheds, timber buildings, fencing panels, garden tools and accessories. For a warm welcome, be sure to pay a visit to the Woodworks Café. When you’re finished in the café, be sure to pop into the gift shop for charming gifts and accessories. Zest 4 Leisure was established in 2005 to bring high quality timber garden products to garden centres, online retailers and major purchasing groups across the UK. Its FSC-certified range (FSC®C114990) range has expanded over the years to include everything from outdoor dining furniture, arbours and obelisks to fence panels and an extensive ‘grow your own’ range. Zest’s commitment to manufacturing and sourcing the highest quality product ranges and satisfying the exact needs of its customers has earned it an enviable reputation for being an innovative and dynamic organisation, securing its position as a leading force in the outdoor leisure industry. Zest 4 Leisure’s expertly designed and manufactured products are competitively priced and can be delivered in any quantity including a home delivery option. Look for our FSC®-certified products. Zest 4 Leisure Direct, the home delivery arm of Zest 4 Leisure, dropships a selection of timber garden products to consumers on behalf of a variety of online retail partners. Drawing upon over 30 years of experience in the timber industry, our range has expanded over the years to include everything from dining furniture, arbours and obelisks, planters to an extensive grow your own range. We are proud to hold an extensive range of over 140 high-quality products. Our customer base includes specialist garden and leisure e-commerce businesses, as well as general home retailers. We are dedicated to becoming the supplier of choice for online retailers We are part of the family-owned P&A Group based in Mold, North Wales. With a timber heritage spanning five generations, we have vast industry knowledge and expertise. P&A Pallets & Packing Cases is the founding division of the P&A Group and has been supplying pallets and packing cases to businesses operating throughout North Wales and the Northwest for thirty years. During this time, it has acquired a reputation for producing high quality, reliable products backed by outstanding customer service. With its automated production lines, customers can rest assured that pallets and packing cases are efficiently manufactured to consistently high standards. With a skilled workforce and a flexible production process, they are able to respond rapidly to fluctuations in market demand. Pallets can be recycled onsite and we offer a cost-effective pallet repair service. P&A Pallets & Packing Cases manufacture a full range of timber packing cases and crates, including heavy-duty close boarded and lightweight open boarded solutions. A long-standing division of the multi award-winning P&A Group Of Companies, P&A Fencing & Timber Buildings has acquired over thirty years of experience and expertise of developing timber buildings that are robust, sustainable and environmentally responsible. From planning applications to the finishing touches, P&A Fencing & Timber Buildings skilled in-house construction team provides a full service, with access to all the materials and resources of its parent company the P&A Group, for a highly professional service at a competitive price. P&A Timber Buildings & Fencing Division is a member of Constructionline and is an Approved Contractor for all councils throughout North Wales. This status ensures you enjoy an efficient service, quality workmanship and peace of mind. Working closely with its customers to ensure projects are completed on time and within budget, P&A Fencing & Timber Buildings offer a service you can rely on. St Andrews is a friendly, medium sized business centre with offices to rent ranging from 80 to 500 square feet, and for as little as £162 per month. It offers a range of support services and regular networking events, all designed to help start-ups and young companies thrive. St Andrews Business Centre is located in the town of Mold in the North Wales borderlands, close to the A55 and A494 networks. It’s perfect for businesses looking to expand into the North West, with easy access to Chester, Liverpool, Manchester and the surrounding motorway networks. Virtual office packages are also available, meaning your company can gain a presence in the UK without actually having to move here. The P&A Group Of Companies was established in 1985 as a manufacturer of timber pallets and packing cases. We have since grown into a successful, multi-divisional organisation offering a range of services to businesses and consumers alike. As well as maintaining a high level of customer satisfaction throughout our entire group, we operate as a socially and environmentally responsible company. By volunteering our time and resources, we regularly support a number of community and charitable initiatives throughout the year. 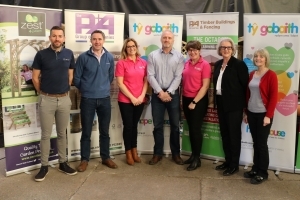 Employees and bosses of P&A Group, a Flintshire-based group of companies, have vowed to raise a pallet stacked high with cash for a children’s charity during a year of fundraising. 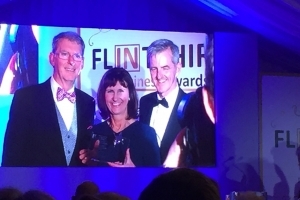 Timber manufacturer, P&A Group, based in Mold, sponsored this year’s Flintshire Business Awards for the Best Company to Work for category, having previously won the award in 2015.